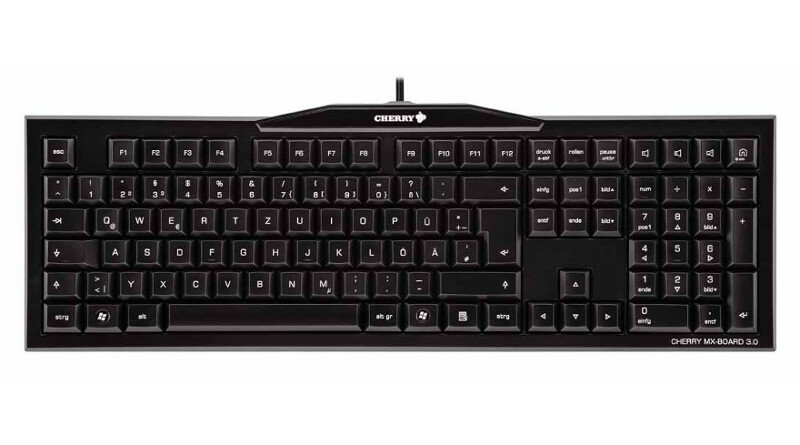 The MX-Board 3.0 is a cheap mechanical keyboard from the German manufacturer Cherry. The keyboard doesn’t necessarily have a particular target group. Depending on the chosen switch type, it might be an interesting keyboard for gamers as well as for typists. Cherry calls the MX-Board 3.0 a “professional keyboard for fast and precise input”. It’s not really surprising, that Cherry features the keyboard with their own Cherry MX Switches. Four different switch types are available for the Cherry MX-Board 3.0 – you can choose between Cherry MX Black, MX Blue, MX Brown and MX Red. The Cherry MX-Board 3.0 supports up to 14 keys pressed at once. That is more than enough for very fast writing and all kind of games. An important feature for gamers is the Win-Key lock – the windows keys can be disabled by a single keypress. This helps avoiding unintentional minimizing of the game. Furthermore the keyboard has three media keys on the right top corner to control the volume. The USB connection cable is about 180 cm long and detachable. A palm rest ist not included by default, but can be ordered separately. "If you’re shopping for the most bare-bones mechanical keyboard imaginable for office use, this is it, but it's not cheap. A choice of Cherry MX key-switch types is the main appeal." "The Cherry MX-Board 3.0 G80-3850 is about as no-frills a design as you can get, but beneath the bland exterior is a well-made, general-use mechanical keyboard." "The MX-Board 3.0 mechanical keyboard is a touch-typist's dream and won’t break the bank." "Compared to most gaming mechanical keyboard, the MX-Board 3.0 is a little lacking in possible features, but the typist in me loves it." "Great first mechanical gaming keyboard for Cherry, needs improvement, but is a decent contender."